Since its introduction to the market in 1995, REV’IT! 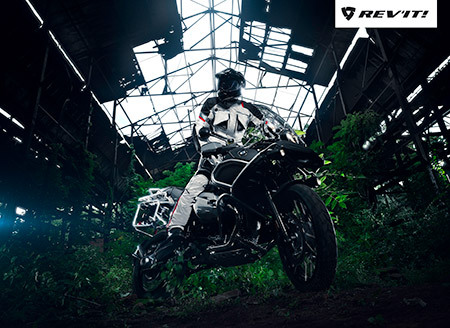 has been a leading innovator in modern motorcycle apparel. We now operate in 70 countries on five continents, united by one primary goal: to inspire people to ride. To that end, we have tackled the toughest design and technology challenges to deliver a high-end product that seamlessly blends fashion, function and safety. The latest collection represents our continued focus on products created for serious touring and adventure riders, a segment which, to us, embodies the true heart and soul of motorcycling. In 2014, the Sand Ladies suit has become a pre-eminent choice for adventure-riding females unafraid to stray from the beaten path. 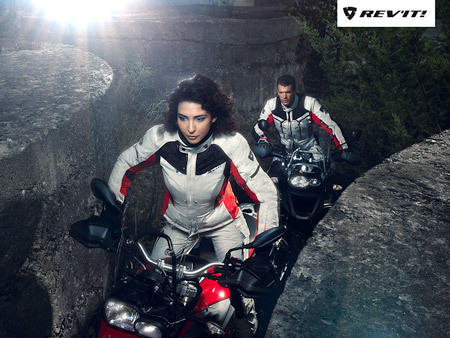 The suit comes fully equipped with female-specific CE-approved armor, reflective panels and ventilation zippers. And thanks to detachable thermal liners and separate waterproof membranes in both the jacket and trousers, it’ll take you where you’re going – rain or shine. For men, REV’IT! has rolled out the Cadillac of all riding suits, the Poseidon GTX. The suit is the only in the world to offer a 100% waterproof membrane with an innovative DIRECT ventilation system, making for an ultra-versatile jacket that handles the pouring rain just as well as the blazing sun. The suit comes with the full suite of CE-approved armor, reflective panels, and detachable thermal liners; this is a world-class product that has already set new standards in quality. Our US headquarters are located in Brooklyn, New York, and are staffed by a diverse group of riders who’ve traveled the world over on two wheels (and lived to tell the tales!) We are pleased to partner with RawHyde to lead you into you next adventure, with gear built to perform in whichever way you like to push the limits.